Agave parryi is more compact than most Southwest agaves, its leaves relatively short and wide, nearly oval in shape rather than the elongated, lance-like (lanceolate) leaves of most species. They are light green or greyish green in color, up to 6 inches across and 25 inches long, though usually rather shorter. The upper surface of each leaf is mostly flat, but slightly concave towards the tip, while the underneath surface is gently convex. The edges have a range of sharp teeth, a little longer than average (1/3 of an inch), between a half and one inch apart. The terminal spines are dark brown, a color that extends a little way back down the upper ends of the leaf. The neomexicana subspecies of New Mexico and Texas has a flatter rosette and a shorter flower stalk, while ssp parryi is more globular, with a longer stalk; this is found across central Arizona, and is common, for example, around Sedona. 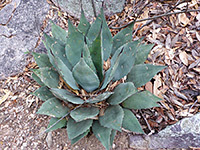 The parryi subspecies itself has three varieties, including var huachucensis, which has the most oval-shaped leaves.